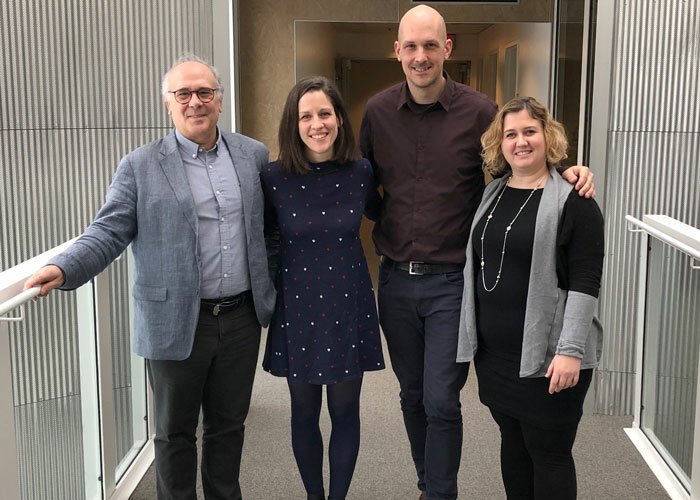 The project team at the CFLA: Director Michel Séguin, Co-ordinators Valerie Patenaude and David Prince, and Communication Project Manager Daphnée Boisvert. HEC Montréal’s business languages training centre, the Centre de formation en langues des affaires (CFLA), has received nearly $157,000 in financial support from the Office québécois de la langue française (OQLF) for its Le français, une valeur qui compte project. The special initiative is designed to encourage students at the School to master and use French in their studies and on the job market. The CFLA already provides regular support for learning and using French and the other business languages taught at the School (English, Spanish and Mandarin). Now, through this project, it will offer a series of new resources and activities specifically focusing on French. This self-directed training will consist of 24 free interactive modules available to students looking to improve their academic and professional writing skills. The first module, on writing professional emails, is already online. These workshops are intended for non-Francophone students, both permanent residents and international students. The formal and informal conversations will help them integrate French-speaking workplaces, and are available by signing up on the project webpage. Written communication workshops are also available for everyone. Students can also sign up for a language twinning program between Francophones and non-Francophones. It’s an opportunity for people looking to develop their skills in French to work with a Francophone interested in learning or practising another language. For the first time, a “French week” will be held at the School from March 18 to 22. There will be a dictation, a student conference, a roundtable discussion, games and competitions, all highlighting the vitality of French in management research and the business world. Alumna Eliana Sanchez’s story is the first in a series of videos to be screened on different platforms at the School as part of this project.